I started this Photos in InfoSpace thread many moons ago, but in typical fashion it seemed to drop off after a few posts. That dropped thread has always bothered me (it almost made it to my blogmares post) and since coming to the Island I have gotten back into the photo-opps, so...I think I'll try this one again. One big reason for coming to PEI was the opportunity to get back to the ocean and beach-combing - a great way to unwind and remind oneself that there is more to life than work. 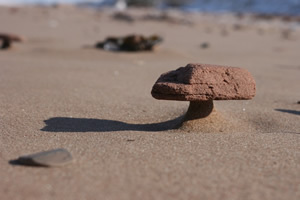 On a recent trip to Brackley Beach I discovered a fascinating phenomenon - what I call Winter Sentinels. The image above is one example. The Sentinels are created when the sand on the beach freezes (like just about everything else in Canada in winter) but the sea-breezes don't: they just keep scouring the sand and all else in the area. 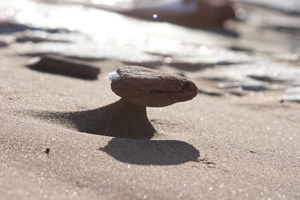 In this case the wind blows the sand from beneath rocks laying on the surface, sculpting a pillar of sand that can be quite resilient. I had a grand old time, laying on the beach with my camera, trying to catch these sentinels in just the right angle. It's a good thing that nobody else was on the beach that day (it was -15 Celsius), or they would have called 911 immediately. Needless to say it was worth braving the cold to marvel at these miniature sculptures - especially looking down the beach and seeing dozens of them with trailing sand "tails" pointing out the wind's path. This one reminded me of the Enterprise - what a nerd! Sony Book Reader - New, or Same Old Same Old? they use proprietary sites for selling/managing the books purchased. I'm not sure what the actual (paid) market for Microsoft products is in South Africa, but according to this news piece it is about to get smaller. The announced initiative commits to open standards as well as open source software on all government computers. When combined with this week's announcement of Google's foray into a paid Office alternative, it can't be good for MS.
Online Worlds to Model Public Health? I liked this story on open source software being distributed to high school kids in France on USB sticks - what a great way to promote open source and give students a free software suite. I wonder if we could do this on PEI without the multi-million $ price tag? Guess someone has to pay for the keys - one can only assume (hope) that all the software will run right off the USB drive without installation. The Metabolomics Toolbox is an impressive resource that doesn't get as much press as the Human Genome Project, but is an equally impressive example of open science at work. This one is particularly interesting given the Canadian roots. It is also a great example of a rich database providing comprehensive information from a range of sources. This existing base of FLOSS software represents a lower bound of about 131 000 real person-years of effort that has been devoted exclusively by programmers. As this is mostly by individuals not directly paid for development, it represents a significant gap in national accounts of productivity. Annualised and adjusted for growth this represents at least Euro 800 million in voluntary contribution from programmers alone each year, of which nearly half are based in Europe. Proprietary packaged software firms account for well below 10% of employment of software developers in the U.S., and “IT user” firms account for over 70% of software developers employed with a similar salary (and thus skill) level. This suggests a relatively low potential for cannibalisation of proprietary software jobs by FLOSS, and suggests a relatively high potential for software developer jobs to become increasingly FLOSS- related. The notional value of Europe’s investment in FLOSS software today is Euro 22 billion (36 billion in the US) representing 20.5% of total software investment (20% in the US). Europe faces three scenarios: CLOSED, where existing business models are entrenched through legal and technical regulation, favouring a passive consumer model over new businesses supporting active participation in an information society of “prosumers”; GENERIC, where current mixed policies lead to a gradual growth of FLOSS while many of the opportunities it presents are missed; VOLUNTARY, where policies and the market develop to recognise and utilise the potential of FLOSS and similar collaborative models of creativity to harness the full power of active citizens in the information society. Sounds like a powerful report - the only thing that bothers me is what was changed in the report as a result of Microsoft's lobbying efforts? Dr. Charles sets a great context for the long-awaited release of the report by the UN's Intergovernmental Panel on Climate Change and does so in a way a lot of us can relate to. In true fashion this is not actually the release of the report, but the announcement of the release :-) The full report will be available in mid-year: in the meantime, the Summary for Policymakers (which is very informative) is available.